Education: The Three Year program at The American Academy of Dramatic Arts. The Brit School of Performing Arts and Technology. Select Credits: Agave – The Bacchae, Paulina – The Winter’s Tale, Mary – Serenading Louie, Original cast member of Douglas Carter Beane’s Robin Hood: A New Musical. Why theater? : Theatre has no boundaries it can venture from movie like naturalism to the abstract and everything in-between. It is a shared experience, between the actors and the audience, which will never be repeated in the same way again. Who do you play in An Ideal Husband: The Scheming, Dangerous, Duplicitous Mrs Cheveley. Tell us about An Ideal Husband: Well its Oscar Wilde’s late 1800’s look at society where honour crumbles under the weight of expectation, and blackmail with a healthy side helping of Wilde’s witticism. What is it like being a part of An Ideal Husband: Fabulous Fun. Since my Last production was The Bacchae where I was pulling apart my own son with my bare hands, therefore Wilde’s witty repartee is a welcome change of pace. Bobby our director is great his directing style is specific yet he gives us room to play and collaborate. I look forward to each and every rehearsal. What kind of theater speaks to you? What or who inspires you as an artist? : Mark Rylance and Frank Langella are the two most inspiring artists I have ever had the fortune to see working and meet. They are true artists. I saw Mark Rylance as Johnny Rooster Byron in Jerusalem and as Richard III, he had the audience in raptures eating out of his palm, yet after the show he comes out in socks and Jesus sandals and barely raises his voice above a whisper. Frank Langella merely described our Job in three stages 1) Learn the words. 2) Understand what they mean. 3) Mean them when you say them. It is their unaffected attitudes towards themselves that makes their work extraordinary. Any roles you’re dying to play? 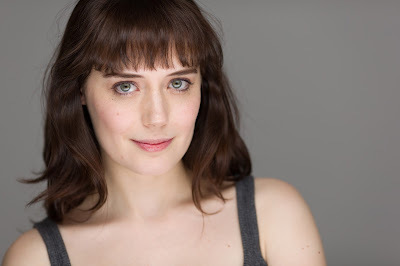 : Probably any role in a period drama which has already been taken by either Keira Knightly or Carey Mulligan, however I don’t think they’ve got around to Catherine Ernshaw - Wuthering Heights or Sue Brideshead – Jude The Obscure. What’s your favorite showtune? : I loved Mary Poppins as a kid so it would probably have to be "Lets Go Fly a Kite". If you could work with anyone you’ve yet to work with, who would it be? : Julian Fellowes, if for no other reason than I could wear a pretty dress and dole out witty slurs à la Dame Maggie Smith. Roman Polanski as well, his work never ceases to amaze and delight me. Who would play you in a movie about yourself and what would it be called? : Recently I’ve been watching Francis Ha and Mistress America, so therefore I would love Greta Gerwig to play me and for Noah Baumbach to direct my biopic, although she is nothing like me she will make my life funnier than it is. Most definitely it would be called “No Nonsense Nonny” – A recent nickname which I enjoy rather. If you could go back in time and see any play or musical you missed, what would it be? : Jude Law’s Hamlet would have been a sight to see. What show have you recommended to your friends? : A View from the Bridge, such refreshing non naturalistic staging. What’s your biggest guilty pleasure? : Terrible Telly, completely devoid of any artistic merit, Dance Moms and Gossip Girl to name some. What’s up next? : I am also rehearsing for an all female adaptation of Titus Andronicus called Martyr’d Signs with Hudson Shakespeare Company, which shall open in April, also I was featured in a couple of short films I shot over the summer intended for a spring release!! !